Go to original pattern for design DROPS 197-21. Knitted scarf in DROPS Air and DROPS Brushed Alpaca Silk. Piece is knitted in uni-colored English rib and 2-colored English rib in stripes. 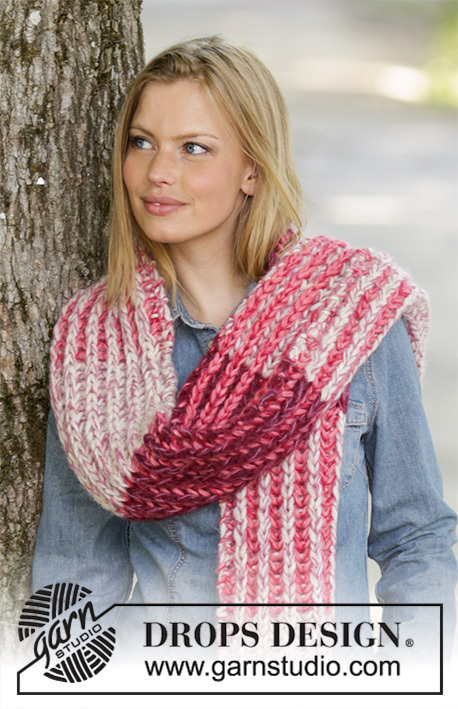 The entire scarf is knitted in 2 strands DROPS Air and 1 strand DROPS Brushed Alpaca Silk. 6 stitches with 3 strands and English rib = 10 cm = 4” in width. 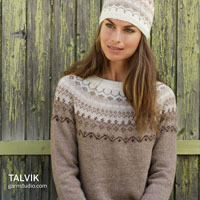 You can get the yarn to make this pattern from	44.85$. Read more. Color A = 2 strands wheat Air + 1 strand heather Brushed Alpaca Silk. 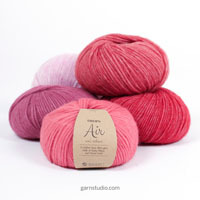 Color B = 2 strands rose Air + 1 strand red Brushed Alpaca Silk. Color C = 2 strands ruby red Air + 1 strand heather Brushed Alpaca Silk. 2 rows in English rib = 1 visible stitch vertically. 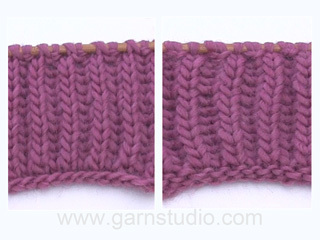 ROW 1 (= right side): 1 edge stitch in garter stitch, * knit 1, make 1 yarn over, slip 1 stitch purlwise (insert right needle into stitch on left needle from right to left) *, work from *-* until 1 stitch remains before edge stitch, knit 1 and finish with 1 edge stitch in garter stitch. ROW 2 (= wrong side): 1 edge stitch in garter stitch, * make 1 yarn over, slip 1 stitch purlwise, knit yarn over and slipped stitch together *, work from *-* until 1 stitch remains before edge stitch, make 1 yarn over, slip 1 stitch purlwise and finish with 1 edge stitch in garter stitch. ROW 3 (= right side): 1 edge stitch in garter stitch, * knit yarn over and slipped stitch together, make 1 yarn over, slip 1 stitch purlwise *, work from *-* until 2 stitches remain before edge stitch, knit yarn over and slipped stitch together and finish with 1 edge stitch in garter stitch. 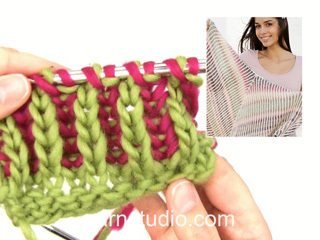 If you do not know which color to work with on next row when working 2-colored English rib as explained below, see which color the previous row was by looking at color of edge stitch. 1 edge stitch in garter stitch, * knit yarn over and slipped stitch together, make 1 yarn over, slip 1 stitch purlwise *, work from *-* until 2 stitches remain before edge stitch, knit yarn over and slipped stitch together and finish with 1 edge stitch in garter stitch. Then push the stitches back on circular needle so that next row is also worked from right side. Switch color and read KNITTING TIP. 1 edge stitch in garter stitch, * make 1 yarn over, slip 1 stitch purlwise, purl yarn over and slipped stitch together *, work from *-* until 1 stitch remains before edge stitch, make 1 yarn over, slip 1 stitch purlwise and finish with 1 edge stitch in garter stitch. Turn and switch color. 1 edge stitch in garter stitch, * purl yarn over and slipped stitch together, make 1 yarn over, slip 1 stitch purlwise *, work from *-* until 2 stitches remain before edge stitch, purl yarn over and slipped stitch together and finish with 1 edge stitch in garter stitch. 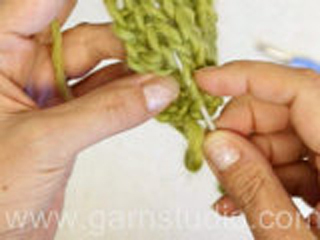 Then push the stitches back on circular needle so that next row is also worked from wrong side. Switch color. 1 edge stitch in garter stitch, * make 1 yarn over, slip 1 stitch purlwise, knit yarn over and slipped stitch together *, work from *-* until 1 stitch remains before edge stitch, make 1 yarn over, slip 1 stitch purlwise and finish with 1 edge stitch in garter stitch. Turn and switch color. Piece is knitted in stripes with uni-colored English rib and 2-colored English rib. Work the entire scarf with 2 strands Air + 1 strand Brushed Alpaca Silk (= 3 strands from yarn group C). Cast on 19 stitches on needle size 10 mm = US 15 with 2 strands wheat Air + 1 strand heather Brushed Alpaca Silk (= 3 strands). Purl 1 row (= wrong side). Work next row as follows from right side: 1 edge stitch in GARTER STITCH - read explanation above - * knit 1, purl 1 *, repeat from *-* until 2 stitches remain on needle, knit 1 and finish with 1 edge stitch in garter stitch. Work back from wrong side with garter stitch over garter stitch, purl over purl, knit over knit. Work 24 cm = 9 1/2” with UNI-COLORED ENGLISH RIB – read explanation above. 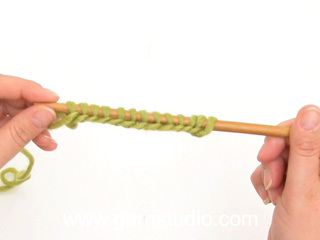 REMEMBER THE KNITTING GAUGE! Work 20 cm = 8” with 2-COLORED ENGLISH RIB IN COLOR A AND B – read explanation above and read KNITTING TIP. Work 20 cm = 8” with 2-COLORED ENGLISH RIB IN COLOR B AND C – read explanation above. Work 15 cm = 6” with UNI-COLORED ENGLISH RIB. Work approx. 22 cm = 8 3/4” with UNICOLORED ENGLISH RIB and finish after 4th row. Scarf now measures approx. 171 cm = 67 1/4”. Work next row as follows from right side: 1 edge stitch in garter stitch, * knit yarn over and slipped stitch together, purl 1 *, work from *-* until 2 stitches remain before edge stitch, knit yarn over and slipped stitch together and finish with 1 edge stitch in garter stitch. On next row loosely bind off with garter stitch over garter stitch, purl over purl and knit over knit. Scarf measures approx. 173 cm = 68”.